We’ll report what we’ve found and, if we can help, how long it should take and at what cost. During the second visit, referred to as a “Report of Findings” the doctor will discuss the results of the previous examinations and imaging studies to explain the problem and your treatment options, either with our office or with a different specialist when necessary to treat your condition. Recommendations, suggestions, any further testing, and any concerns will be addressed during this visit with the doctor. The goal of this visit is that when you leave the office, and you get the inevitable phone call from a concerned loved one asking, “So what did the doctor say?”, that you should actually be able to answer that question with confidence, and not only know what the problem is, but how it happened and more importantly, what your options are for correcting it. A typical visit will be much shorter, but just as important! 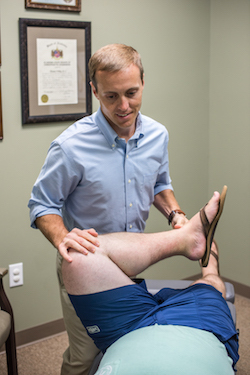 We will chart your progress since your last visit and make sure we are doing everything we can to help you! A typical visit will vary slightly, depending on which phase of healing you are in. We have found it to be beneficial if we focus on your care in 3 phases. The “Relief” phase is focused on getting you feeling better, and can take any where from 2-3 days to 4-6 weeks. Treatments during this initial time period are designed to get you back to living your life without discomfort as quickly as possible and will utilize a variety of passive treatments such as electric stimulation, ultrasound, decompression, soft tissue massage and of course, spinal and extremity adjustments. These visits will typically run about 10-20 minutes. Once the pain or symptoms have resolved we move into the “Rehabilitation” phase. This stage can be a difficult one for some patients as much of the burden for continued improvement is shifted back to them. Stretches and exercises are utilized during this phase of healing, and are designed to help rebuild damaged or deconditioned tissues (i.e. muscles, tendons, ligaments, discs) to help support and keep the pain from returning. This phase is necessary to keep the symptoms from returning, much like brushing your teeth in-between visits with the dentist. These treatments usually run approximately 20-30 minutes, depending on which types of exercises will be worked on. The last phase, an optional one, is the “Maintenance” phase. During this time period, most of our patients enjoy feeling healthy and sometimes even surprise themselves at how much better they can feel when they continue to work toward their health goals. These visits are typically much less frequent and may occur once per month, once per quarter or as needed. Long story short, some visits will involve only adjustments, while others will involve other types of therapy designed to support the adjustment, each visit is tailored to your specific condition and no two visits are exactly the same. Ready to get started? 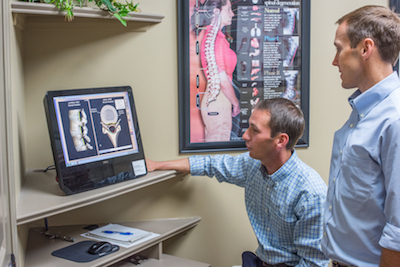 Give our Auburn chiropractic office a call and begin care today.